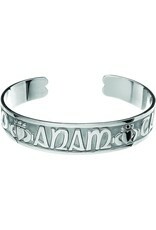 Silver Bangle Mo Anam Cara "My Soul Mate"
Anam Cara is the beautiful Celtic phrase which loosely translates as Soulmate. "Anam" is the Irish Gaelic word for soul, "Cara" translates to friend. So, the literal meaning is "Soul Friend". It doesn’t just describe the union of two people as a couple or friends but rather, it describes a very specific and special relationship between any two people. Your lover, your best friend, or your family member may be your soul friend and described as mo Anam Cara.